The SW coast of France, from the mouth of the Gironde up to Bordeaux, and south to Arcachon. Scale: 1 : 127.000. Larger scale plans of Royan, Pauillac, Port Bloc, Arcachon, Bordeaux, la Garonna, and la Dordogne to Bordeaux and Libourne. Also includes a plan of La Gironde and La Garonne (Scale: 1 : 200.000) on the reverse of the chart. 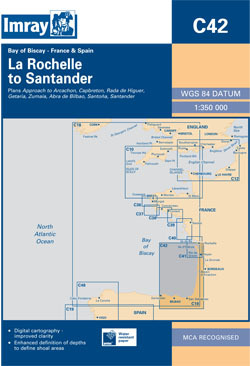 On this 2013 edition a new plan of Laredo Marina has been added, the plan of La Gironde and La Garonne on the back of the chart has been improved, and the sketch plan of Capbreton has been replaced with a WGS84 - compatible plan. Harbour developments are shown at Bilbao, and the latest depths have been applied throughout, especially at La Gironde, Bassin d’Arcachon and Santander.